Space Dogs follows suit in a long line of computer animated feature films that tell of earthen critters being sent into space prior to mankind’s own journey to the stars (check out Space Chimps or Fly Me To The Moon for further examples in the genre). While all of the above films claim to be based on some degree of historical fact, Space Dogs represents the first animals to have survived a Soviet launched orbital space trip; particularly from the fictional perspective of real-life canines Belka & Strelka. If you’re very familiar with contemporary CG film catalog, it could best be described as a cross between Sony’s Open Season 2 and Starz’ Space Chimps. If that means nothing to you, read on for a more in depth breakdown of the film on its own merits. Released in Russia back in March of 2010 as Белка и Стрелка (Belka n Strelka), the film wears a G-rating, comes in a run-time of 85-minutes and was created on a budget of roughly $35-million. 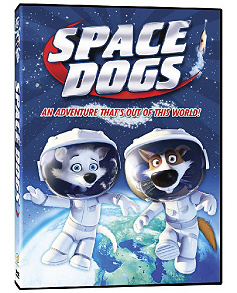 Phase 4 Films gave it the English dub treatment, burned it to Region 1 standards and released it to DVD and blu-Ray as Space Dogs a couple of years later (June 10, 2012). The story, which is far more simplistic in summation than its 85 min-run-time demands, tells of a stray and a circus dog who are in essence kidnapped into military service, which begins with rigorous training for what will be controlled space flight. Since, at it’s core, the story could probably be told in about three to five minutes, what you really get is quite a bit of fictional back story in attempt at character building among the many talking animals involved in the tale. 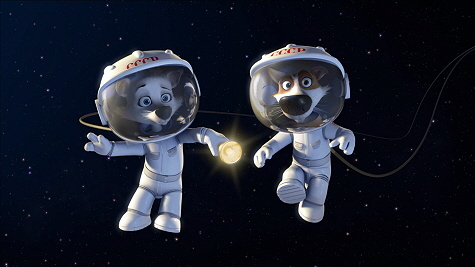 Additionally, the film’s pacing seems a tad askew as a result: the vast majority of the tale centers on the dogs’ training with only a couple of minutes dedicated to the space flight itself (and even then it’s a bit curious in terms of the Belka & Strelka repairing the original Sputnik with a flashlight battery or Strelka suddenly taking control of the ship, flying it through an asteroid belt and so on). Perhaps I’m being overly critical concerning elements that were surely added for the visual enjoyment of children. History buffs, you’ve been warned. The film’s visuals are also a bit lackluster for what was possible by 2010 in terms of computer generated animation. The animal models themselves are certainly passable enough but the textures throughout are simplistic and drab, and the animation rather stiff. The human models seem to represent the production crew’s biggest challenge and are thus absent almost entirely throughout the picture (though it is only fair to mention that a brief appearance of JFK in the beginning both looks and sounds great). Of course all of this criticizing surely makes the film come off as unwatchable and in truth, it does many things well deserving of mention. For starters, the dub is surprisingly solid. For a film not originally created in English, Phase 4 did a bang up job adapting the mouth flaps to the sentences of the new script. This is more than just a timing accomplishment; as making a coherent film is more than just having words and mouth flaps match, credit is due in designing a script that manages to tell the story accordingly, keep the flow of conversation natural and so on. Space Dogs certainly succeeds here. 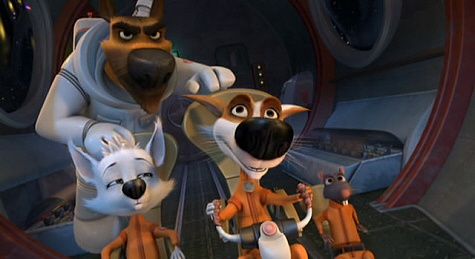 Additionally, while kids young enough to get the most out of the film’s gags will likely care little for the fact that the story is based on some semblance of history, the actual footage of the dogs (and even rodents) involved in the spaceflight during the closing credits is certainly a nice touch; especially appreciated by older viewers who find the space race and the science behind it interesting. In conclusion, Space Dogs is a cute little film that does its best not to offend but never really strives for excellence in any arena either. Younger viewers will be a lot more forgiving of the fluff that abounds to fill its run-time. Anyone else who enjoys it may also want to give 2008’s Space Chimps a look.